As is now customary ahead of Davos week, the latest World Economic Forum report on global risks was released and the usual graphic of the top 5 global risks in terms of likelihood and impact are reproduced below. 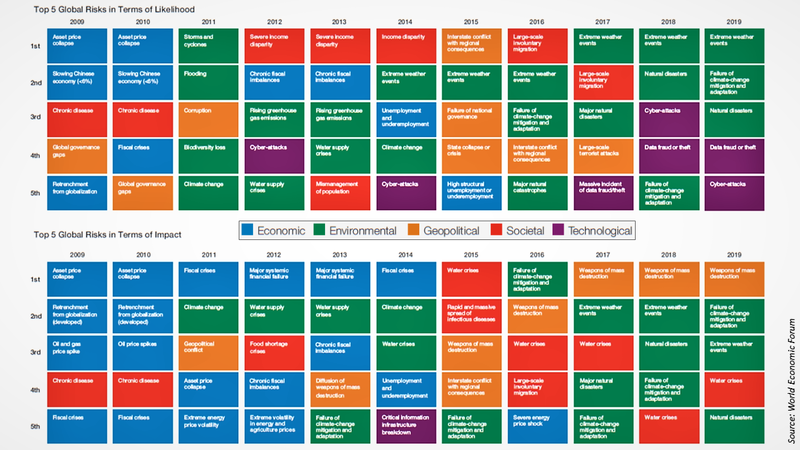 Environmental risks and technology risks again dominate the likelihood list which is indicative of the current consensus. As this post highlights, the likelihood of irreversible climate change within the next 10 to 20 years is the short, medium and long-term issue of our times. Although the report does state that “geopolitical and geo-economic tensions are rising among the world’s major powers” and that these “tensions represent the most urgent global risks at present”, I was somewhat surprised to see that geopolitical risk did not make the top 5 likelihood list this year. Despite the current market (wishful in my view) thinking of a kick the can down the road fudge outcome, Brexit in 2019 may result in a constitutional crisis in the UK or the possibility of a large portion of the population being alienated by a possible rushed outcome this Spring (e.g. hard Brexit or permanent custom union). His Orangeness and his ability to flame division, whether internally in the US after a bad Mueller report or against China to deflect from his pitiful negotiating style, are ever present possibilities for 2019 (if not hopefully remote ones). Although maybe somewhat alarmist, I can’t but help worry that his reign may end with some form of violent turmoil, he will not go quietly! As an aside, the wonderful TV show “Brexit: The Uncivil War” from the UK’s Channel 4, which I think is on Netflix now, does raise the issue of how democracies will operate in a world where all sides can use technology to manipulate a (potentially decisive) disengaged minority to the political extremes. If the long-term success of democracy is dependent upon compromise, then we may be in trouble. Pundits say the implications of Brexit politics is a break from the traditional left/right or conservative/liberal divide, into a much more complex mixture of differing tribes. In fact, I would highly recommend this video from Dominic Cummings, the main subject of the show, who ably explains the parameters of the new political landscape (if you don’t have the time to watch it all, watch a few minutes after the 15-minute mark on how they did it). One other item that caught my attention in the WEF report, in section 6 called Open Secrets, was the assertion that when “the huge resources being devoted to quantum research lead to large-scale quantum computing, many of the tools that form the basis of current digital cryptography will be rendered obsolete”. The article further asserts that “public key algorithms, in particular, will be effortlessly crackable” and, under certain scenarios, “a collapse of cryptography would take with it much of the scaffolding of digital life”. Do I hear a new arms race approaching? The report predicts “as the prospect of quantum code-breaking looms closer, a transition to new alternatives—such as lattice-based and hashbased cryptography—will gather pace” although “some may even revert to low-tech solutions, taking sensitive information offline and relying on in-person exchanges”. Imagine having to rely on people meeting other people to get things done……..unthinkable!